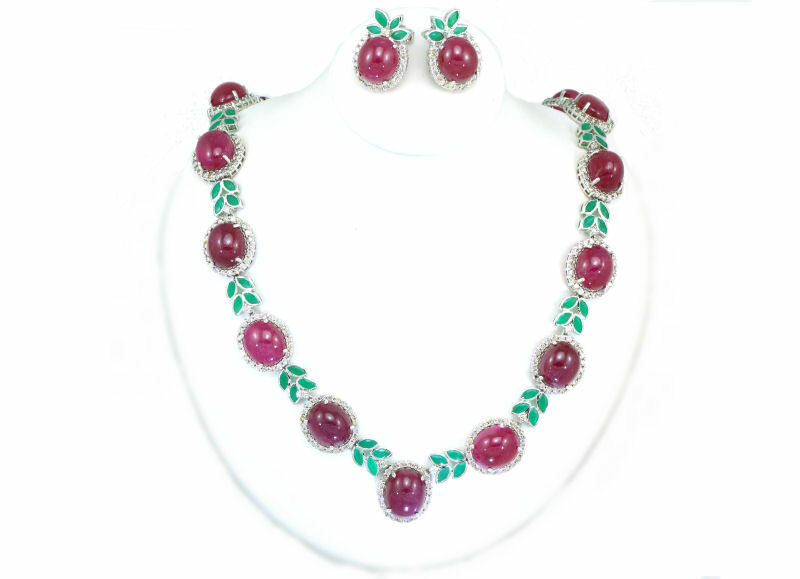 This luxurious flower design necklace and earrings set is beautifully crafted in bright polished 14K white gold. 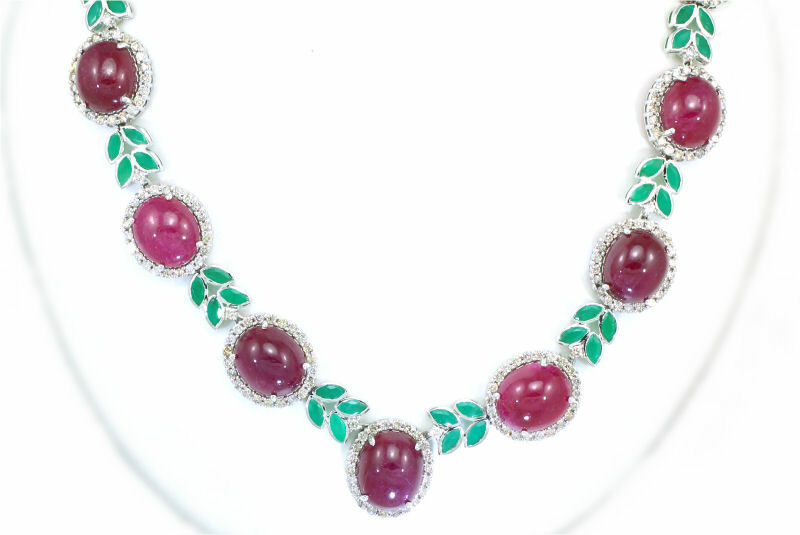 The white gold ruby and emerald necklace is made of 12 oval links. 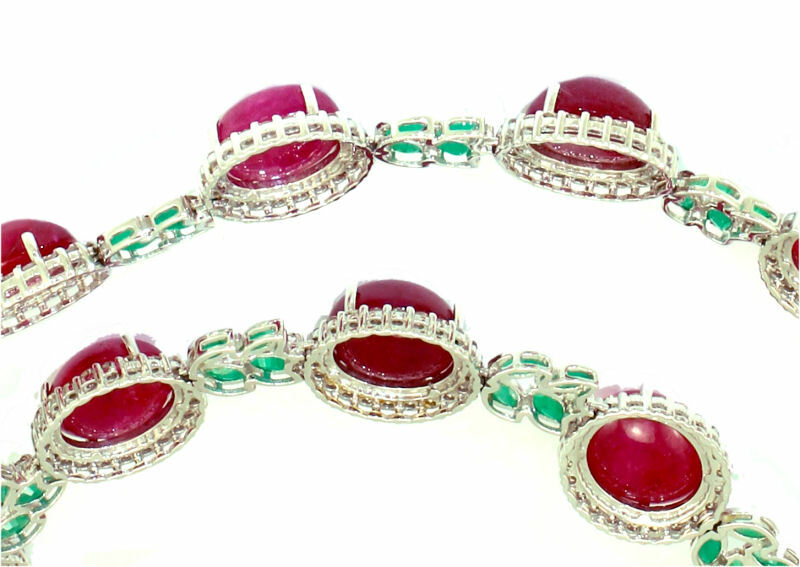 Each link has a 12.50mm x 10.50mm oval cabochon-red ruby treated to enhance colour at the centre surrounded by 22 round brilliant diamonds of 1.50mm diameter each, between each ruby links there are four rich green marquise emeralds of 5mm x 2.5mm each as leafs of the flower. 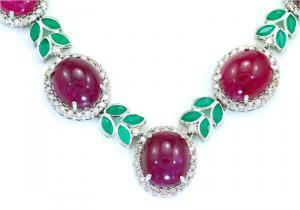 The necklace also has a further cluster as a pendant drop attached to the centre of the necklace. 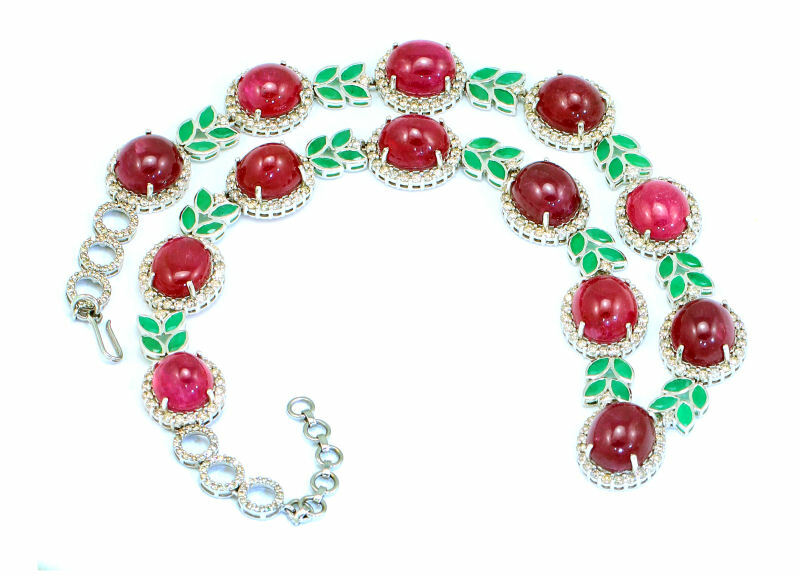 The rubies have a total weight of 32.50 carats. 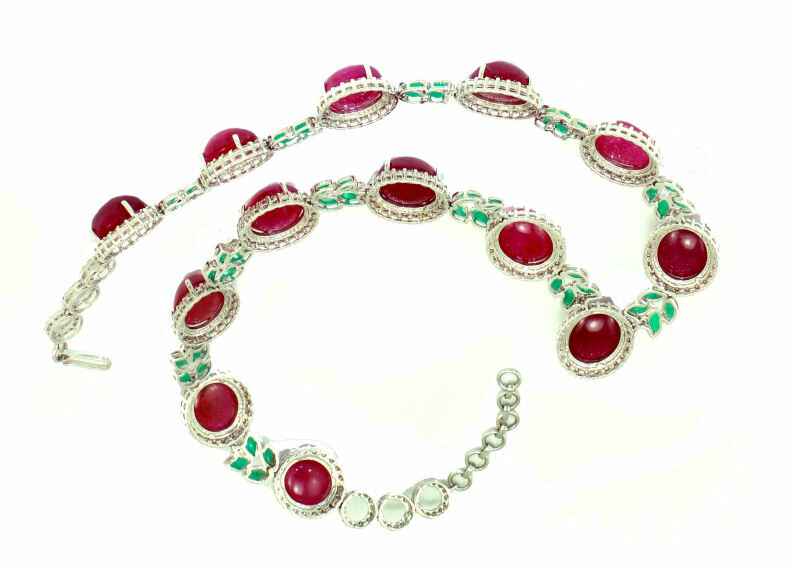 In addition, six diamond set round links of 14 diamonds in each ring (1.2mm diameter each) finish off the necklace. The diamonds have a total weight of 6.59 carats, I1/I2 clarity and I/J colour. The necklace has a total weight of 62.0 grams and it is completed with a fish hook necklace lock. The necklace is complimented by a dazzling pair of matching earrings to make up the complete set. 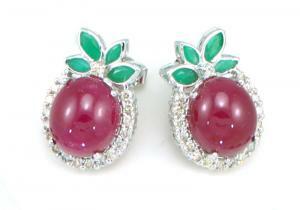 Each earring has a single oval-cabochon prong-set ruby weighing 2.50 carat (i.e. 5.00 carats for the pair) and measures 12.50mm x 10.50mm each. 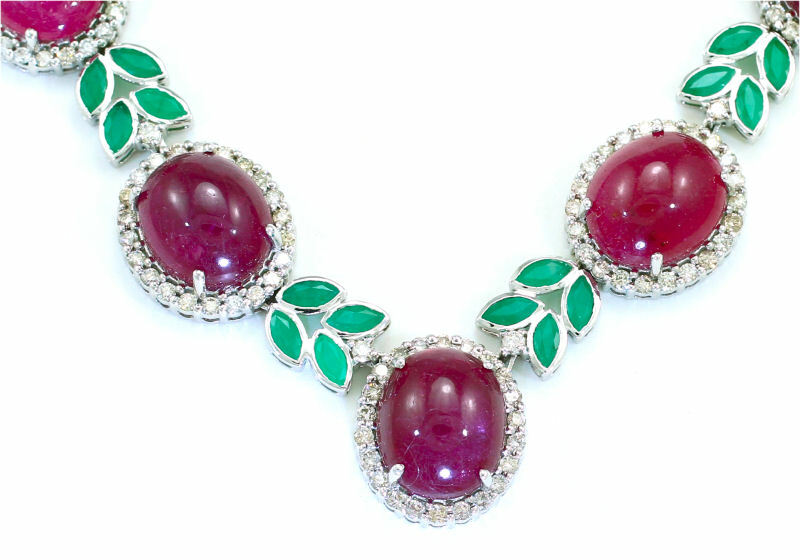 Each ruby has four rich green marquise emeralds of 5mm x 2.5mm each as leafs of the flower. 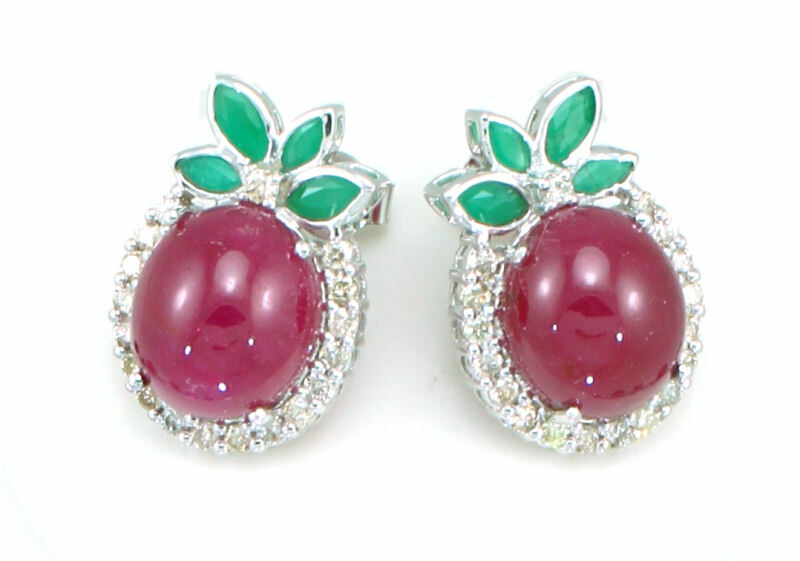 The pair of earrings have a grand total of 40 round brilliant cut natural diamonds with a combined weight of 1.0 carats. The diamonds have I/J colour and I1/I2 clarity ratings. The total weight of the pair is 9.80 grams and each earring measures 15.00mm across and 21.26mm long. 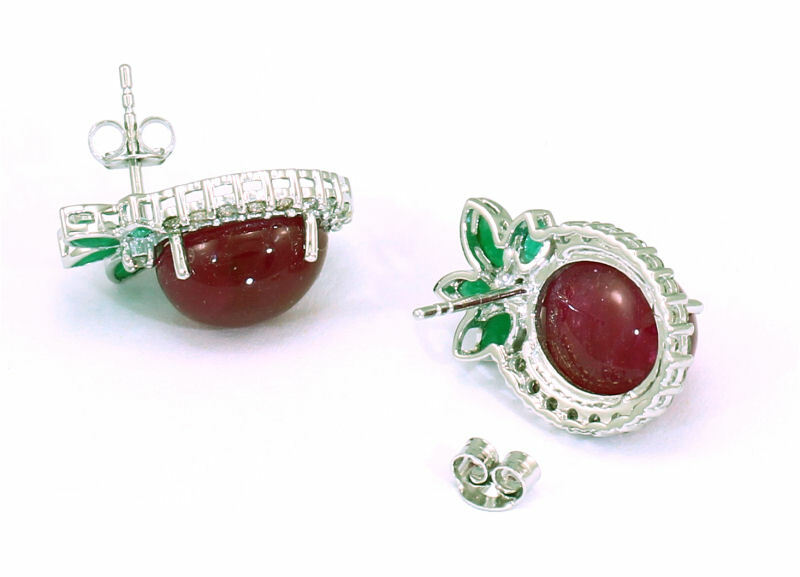 Each earring is secured with a post and catch backing. An independent jeweller's certificate is provided with this set, with a valuation of £10,300.